Attractive, holiday accommodation near Penrith on the edge of the English Lake District in Cumbria. 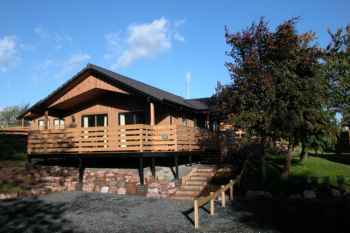 This recently built property is in a development of similar lodges in a rural setting at Yanwath, between the Lakes and the Eden Valley. Amber Nook is conveniently situated for travelling being near the M6 and the A66. It is also well positioned to allow touring in The Lakes, Eden Valley and even the Scottish Borders. The Roman wall is within easy travel for an interesting day out. As is the Solway coast. Our choice of a pine lodge was a very deliberate one, the area has a shortage of affordable homes for young locals, we did not feel it acceptable to take a cottage out of the small available stock and deny its use to those who need it.